The family of a woman who died after being found stabbed in Berkshire said she had begun a college course to help those with mental health problems. 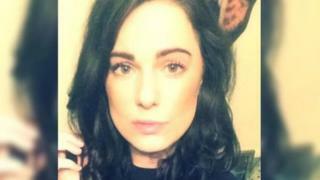 Kylie Dembrey, 28, was found injured in a home in Blossom Lane, Theale, on 6 September. Her family said Ms Dembrey "faced challenges in her life, but she overcame them with her sassiness and sense of humour". A man appeared in court on Tuesday charged with her murder. Mark Sinclair, 30, of no fixed address, appeared at Reading Crown Court via video link and was remanded in custody to appear at trial on 25 February. A family statement said the mother-of-two "had a big personality" and their lives would "not be the same without her". It added: "We shall miss her smile and laugh and our world will be a quieter place without her." Thames Valley Police said a post-mortem examination found Ms Dembrey's cause of death was "shock and haemorrhage as a result of stab wounds to the chest and neck".